The Yamoto Tunnel Tombs (yoko ana bogun) were exposed during a massive slide during a strong earthquake that hit northern Miyagi prefecture in 2003. This was followed by preliminary studies that scrutinized the skeletal remains of individuals from the tombs. The initial study found that burial tomb 64 contained a number of individuals whose cranial measurements were close to Jomon and epi-Jomon remains (see page on Yamoto burials above). The rest of the remains from mostly other burial tunnels were related to contemporary Japanese such as the eastern Kanto Kofun protohistoric populations. This preliminary study was followed up by a more detailed analysis of the skeletal remains that by and large confirms the initial findings, however, there are some important differences, one of which seems to indicate (though not confirm) that this area near Yamoto was controlled by a local Emishi gozoku (great family) rather than a Japanese gozoku. This of course cannot be verified with certainty, but the remains suggests that this explanation has more weight (2008:47). The study also suggests that in a nearby tunnel tombs the opposite was the case which reinforces the view that the area of the present day Sendai plain during this time period (mid-seventh to early ninth centuries AD) was a time when both Japanese colonists and Emishi locals competed for power in this region. About forty individual skeletal remains were unearthed there at the time of this study between 2004 and 2006 (2008:37). Out of these remains twenty were studied, and out of these twenty, the data for fifteen were included in this article. The reason behind the inclusion of just half the samples is unknown, but the state of skeletal remains in Japan make comprehensive measurements very difficult. The five left out from the twenty included were for this reason. The skulls in particular were measured in comparison to six known historical populations: northern Kyushu Yayoi, northern Kyushu Kofun, eastern Kanto Kofun, eastern Japan Jomon, Hokkaido epi-Jomon, and finally Hokkaido Ainu. Modern Japanese measurements were also included. The modern Japanese fall into the group consisting of Northen Kyushu Yayoi, northern Kyushu Kofun and eastern Kanto Kofun which for the sake of this review will be called group B. This group differs significantly from the eastern Japan Jomon, the Hokkaido epi-Jomon and Hokkaido Ainu group which will be labeled group A. From this data it was found that the Yamoto remains fall into two categories: ten remains that in the main fall into the measurements for group B, and four that fall into group A (2008:43). The problem is a few of the remains do not separate out neatly into the two groups. For example, one female skull's measurements from tunnel 49 are approximately halfway between group A and group B. This reflects what the authors call a complex mixing of both Kofun and Jomon characteristics. Group A represents 26% of this small sample while group B represents 66%, but the total number is too small to be statistically significant. And unlike the initial finding tunnel 64 was not the only tunnel burial that contained epi-Jomon-like remains, additionally, one eastern Kofun-like individual was found in tunnel 64 so this tunnel was not exclusively made up of epi-Jomon-like people. This eliminates the possibility of this particular tomb being exclusively used for a particular group segregated from the other tombs. This was a mixed population that incorporated epi-Jomon natives and eastern Kanto Kofun migrants. From their positon northeast of Taga castle (built in 724 AD) in the still contested Sendai plain, during the mid-600's to early 800's when these tombs were made, there is an indication that this was indeed an Emishi group which incorporated both epi-Jomon and later migrants to the region, who by this time had identified with the Emishi. The fighting that erupted in this region through the rebellion of Korehari no Kimi Azamaro in 774, and was practically endemic during the eighth century AD was centered in this area. Most likely this group in Yamoto was either associated with Azamaro or his rival the fushu Michishima who was allied with the Japanese. The evdience will probably not be found to verify this actual association, but judging from the length of time they inhabited this region and the large number of tombs found suggests this was not a small family. In fact, I would surmise these tombs could have been built by one of these historical families. This is the kind of large scale burial complex that would be expected of a powerful regional family such as Azamaro or Michishima. If this is correct it would be the closest physical evidence that we have of a historically known Emishi family. This would not fall into the expected pattern as I have elsewhere discussed on the Tohoku Kofun population page, however, given scholars differing interpretaions on the Kofun population as a whole, this detailed finding is as close as one can possibly get to confirming the mixed ethnic nature of the Emishi, at once representing the older population of Japan and the more recent arrivals (2008:48). There are limitations in the study of skeletal remains. Except for basic facial structure these remains do not reveal their actual physical appearance except in an indirect way by association from what is known about their modern descendants the Ainu and certain Japanese. They do not shed light on their language, what they wore, if they had tatoos, or even facial hair. There are other studies that have concentrated on the material artifacts from similar tombs from other sites which I have covered elsewhere, but to date there have been no detailed studies done on the material atifacts from this site. To put this in perspective if we look at the whole area where these tunnel tombs have been studied, including the Goshozan and Kumanodo tombs nearby then it appears that the population as a whole looks similar to the eastern Kanto Kofun population from where many settlers came from, but this overlooks the details. As is usually the case, the details show that each of these sites are unique and must be taken account of individually. 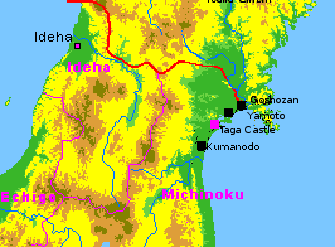 For example, though the scope of this review does not include Goshozan or Kumanodo remains which are actually other tunnel tomb locations that are close to Taga Castle (see map; the red line indicates the frontier between Japan and Emishi held areas in the first quarter of the eighth century), they are used as points of comparison to Yamoto in the present study. When looked at separately these other tunnel tomb sites do not contain any clear Jomon-like individuals except for one person. If we simply add the remains found at these separate sites to the Yamoto site it would skew the population to being more similar to the eastern Kofun population. It would mask the fact that Yamoto site population is roughly one-third Jomon-like and two-thirds Kofun-like. It would in fact mask the scenario of a very mixed population. However, if we separate out each site and look at the populations separately we see that Kumanodo tunnel tombs contain a Kofun type population, most likely because this site was made up of Japanese immigrants to the area. Oddly, the nearby Yamoto site remains show a large contrast from the Kumanodo site, a difference that is greater than between some historically removed populations. The Goshozan site looks likely to be an ancient Japanese site being made up of a mainly eastern Kanto Kofun and northern Kyushu Kofun type population though active earlier than Kumanodo. In other words, though each of these three sites are fairly close to Taga Castle each site differs population wise and were most likely made up of competing groups. The Kumanodo site was most likely a Japanese gozoku family site, settlers who moved to the Sendai plain. These frontier families eventually amassed a great deal of power after the Emishi conquest, and at this time made up part of the military forces of the local ritsuryo government. The point here is that taken by itself each site was composed of either mainly Japanese settlers or immigrants and their descendants or local Emishi and their descendants (which included descendants of mixed Emishi and Kofun people). Looked at this way, this fits into a regional pattern that was highly complex and defies easy ethnic separation. As I have stated elsewhere (see Emishi Migration section) the evidence seems to corroborate a scenario where Japanese Kofun people lived side by side with Emishi locals in the central Tohoku region. And depending on alliances they sided with the Emishi or with the Japanese government to become fushu. This may be the beginnings of the actual verification of this kind of settlement pattern in the Sendai plain. Takigawa, Wataru and Sato, Toshiyuki. Hoku-kin no yoko-ana haka kodai-jin--Miyagi-ken Yamoto yoko-ana bogun shutsu-do jin-kotsu no keisei (Northeastern Protohistoric People: Physical Traits of Human Skeletal Remains from the Yamoto Tunnel Burials in Miyagi Prefecture). [Anthropological Science (Japanese series) V.116(2008):1:35-51].